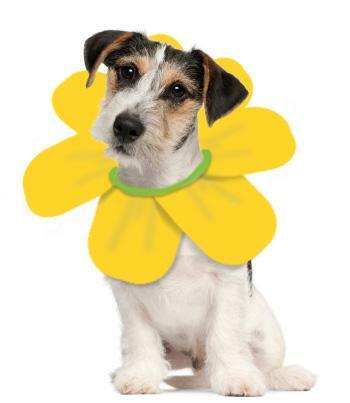 Print a free dog flower costume. There's no reason to spend a fortune on an off-the-shelf look for your pooch this Halloween. If you're handy with a sewing machine and have a couple of hours to spare, you can create a unique costume for your furry friend using a free pattern. Making your own dog costume will save you money and give you a chance to show off your dog's personality. These free patterns require varying levels of sewing experience and work for different sizes of dogs. Choose one that fits your needs, budget, experience, and the size of your pooch. To download any costume, simply click on the image of the pet wearing it. Then save the pattern to your computer. If you need help downloading the patterns, check out these helpful tips. You can use this simple pattern to make a flower collar for your furry friend. It uses stiff craft felt for the petals, and you can choose any color that suits your dog's personality. The pattern is sizable to fit any dog, from the smallest to the largest. Making this costume doesn't require a lot of previous experience. It's quite simple and involves only some cutting and sewing. The sewing is easiest with a sewing machine, but if you don't have one handy, making it by hand will work too. Expect to spend about an hour on this costume if you use a sewing machine. 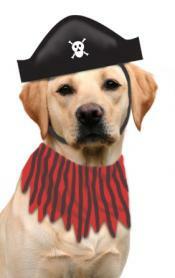 Print a free dog pirate costume pattern. Sized to fit most dogs, this costume is also quite easy to make. All you will need is some craft felt, embroidery floss, elastic, and fabric, and you can create a pirate hat and striped scarf for your dog to wear this Halloween. Although this is a little trickier than the flower costume, it's still a very easy project. You'll fit the hat to your dog to ensure it's the appropriate size, and you'll need to do a bit of very simple embroidery using the included template. You can sew the hat on the machine or by hand, and the scarf doesn't require any sewing. Expect to spend about an hour on this project. Print a free hot dog costume pattern. This adorable outfit works best for medium-sized dogs. For reference, the finished hot dog bun is 16 inches long. You can adjust the girth of the costume to be any size that fits your pooch. You'll need two colors of fleece fabric for this outfit, as well as jersey knit fabric, stuffing, and elastic. This costume requires a bit of sewing experience, but it isn't difficult. You'll need to fit the costume to your dog, and there are more pieces involved in this outfit than in the other options. You'll also need to use a sewing machine for this costume. 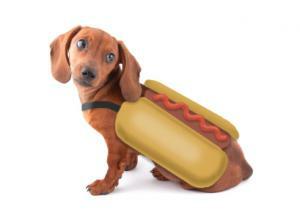 Expect to spend about two hours turning your pooch into an adorable hot dog. Making a Halloween costume for your dog is a great way to include your pet in the fun of this holiday. There are plenty of creative dog costume ideas out there. Use free sewing patterns and a few simple supplies to create a doggie costume that will turn heads this Halloween.